ISLAMABAD (Reuters) - Pakistan's Supreme Court is due on Wednesday to rule on the final appeal by a Christian woman sentenced to death by hanging over blasphemy allegations, a case that has drawn global attention and condemnation. 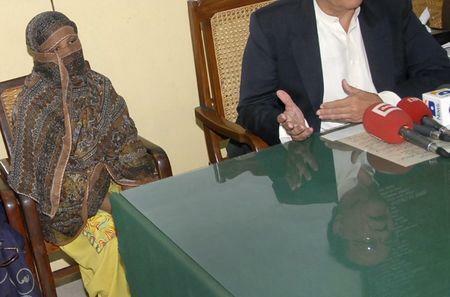 Asia Bibi, a mother of four, has been living on death row since 2010 when she became the first woman to be sentenced to death under Pakistan's draconian blasphemy laws. A special three-person bench headed by Pakistan's top judge, Chief Justice Saqib Nasir, is due to deliver the verdict at 9am local time (0400 GMT), according to a notice by the court. Bibi's case is also high on the agenda of religious hardliners in Pakistan, many of whom are fiercely opposed to her release. The ultra-Islamist Tehreek-e-Labaik Pakistan (TLP) party, which makes punishing blasphemy its main campaign rallying cry, earlier this month warned the court against any "concession or softness" for Bibi. "If there is any attempt to hand her over to a foreign country, there will be terrible consequences," TLP said in a statement. At the Rome gathering, Masih said his wife was innocent of blasphemy. "This is just hate against Christians, who are considered impure," he said.